eBay may not seem an obvious website for genealogists to use, but lurking within the multitude of items it has to offer there are some fabulous family history finds to be made. And while the fabulousness of old receipts might not be immediately apparent, the two I acquired through eBay in 2013 date back to the 1860s – and help to provide a fascinating insight into the school days of Henry Oliver Atcherley [ ]. Henry was born in 1850 at Shaldon, Devon, the third and last child of Dr Rowland Atcherley and his wife Ann. Henry never knew his father, who died in 1851, and it is difficult to know the extent to which he knew his mother. I have yet to find him on the 1851 census, at which time his mother and sister (Anne Isabella) were living with his maternal grandparents Andrew and Eliza Du Moulin in Bath. 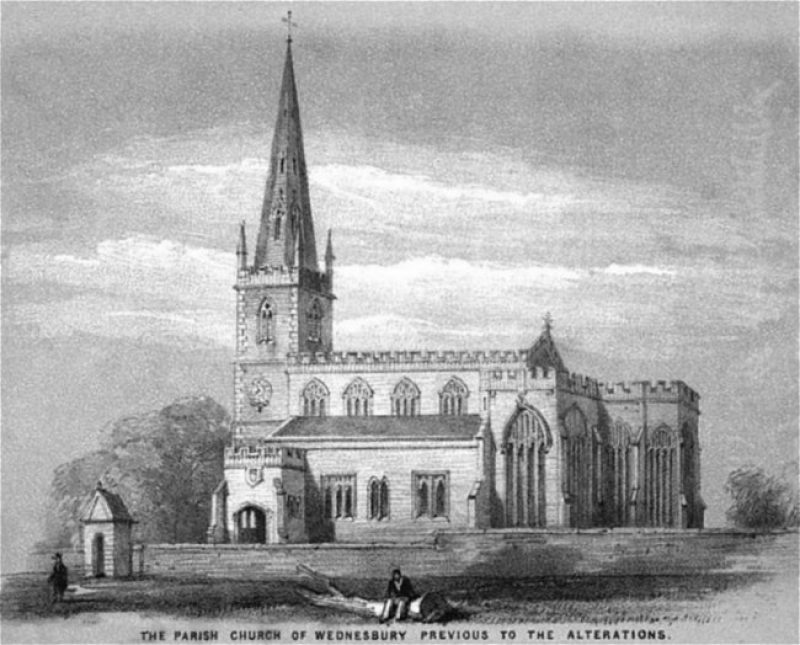 His brother Rowland Hill Atcherley was enumerated with the brothers’ aunts Caroline and Charlotte Atcherley and paternal grandmother Eliza, at Highweek, Newton Abbot. I think it likely that he and Rowland were brought up by one or both of those aunts. To compensate for the Henry’s absence on the 1851 census, we have the two receipts. The first, dated 2 October 1863, has the pre-printed city name “Bath” crossed out and replaced with “Exeter”. It reads: “Received of Mr Hill the Sum of Eighteen Pounds 18/6 due to me for board &c. of H. O. Atcherley the [crossed out: half year] quarter ending the 29th Septr. last as per account indorsed”. It is signed “C Atcherley”. 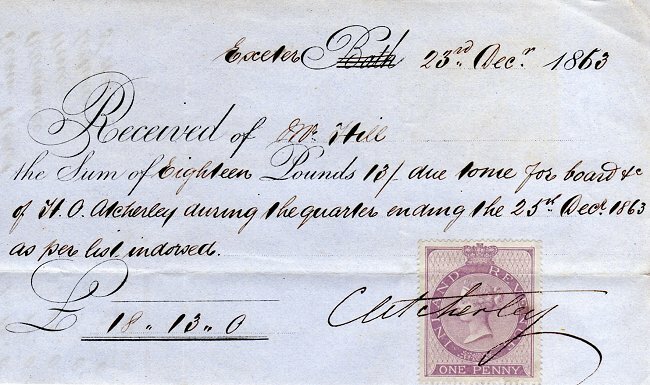 The second receipt, dated 23 December 1863 (see photo of detail below), is very similar but for the lower amount of £18 13s. 0d. C Atcherley would have been either Caroline or Charlotte – but which one? On the one hand, both Henry and his brother Rowland were living with Caroline (at 2 Lower Mount Road Terrace in Exeter) at the time of the 1861 census. On the other hand, Charlotte, along with Bath solicitor Granville Diggle Hill (doubtless the Mr Hill to whom the receipt was made out), was an executor of her uncle Henry Oliver’s will. That will, which was proved in December 1857, included generous bequests (made subject to certain conditions) to Henry Oliver Atcherley (who was Henry Oliver’s Godson) and Rowland. It also included recommendations to Henry Oliver’s executors that they should “place my two great nephews Henry Oliver Atcherley and Roland Atcherley at some good public school Shrewsbury Grammer School for instance with which school their fathers family have been long connected”. The receipts were evidently for money paid to Caroline or Charlotte in respect of their nephew Henry’s schooling: on the reverse of each a breakdown of the sums of money involved was given, as shown below. 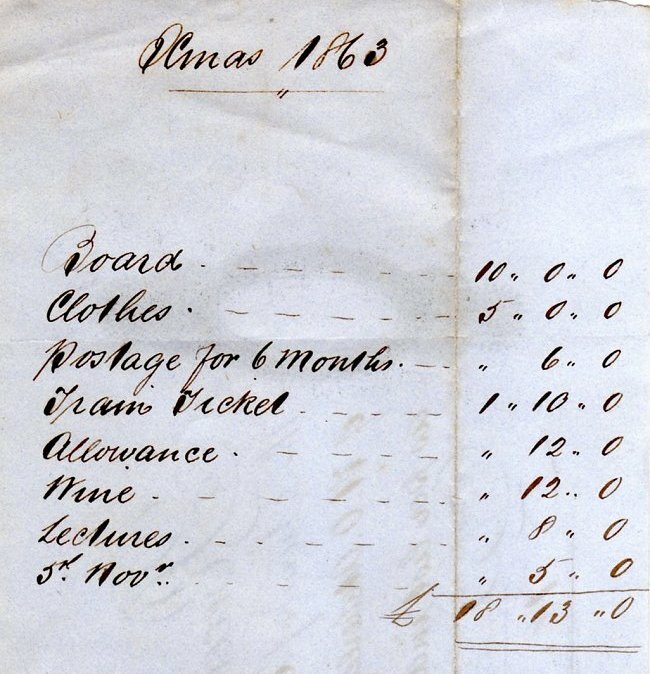 The receipts show that it cost £10 per term for Henry’s board, with £5 per term allowed for the cost of his clothes, and 12 shillings a term for wine (Henry was aged 16 at this time). He was also given an allowance, of 6s. 6d for Michaelmas term but 12 shillings for Christmas term; in the latter term he also received 5 shillings for the festivities of the fifth of November. Some expenses were charged (or accounted for) at half-yearly rather than quarterly intervals, namely fees for lectures (8 shillings) and postage, presumably for letters sent by Henry to family members. 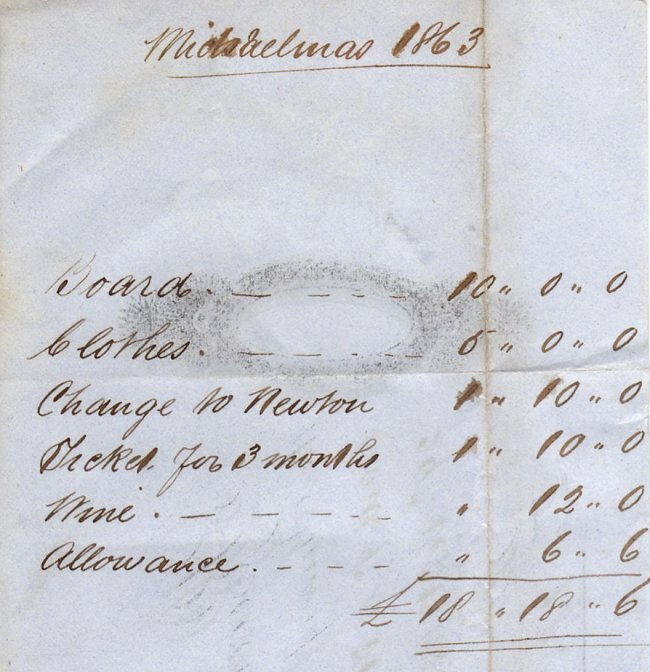 The other item of expenditure was travel by train, at a cost of £1 10s per term, plus an additional £1 10s for the change to Newton (Newton Abbot) in Michaelmas term, enabling Henry to visit either or both of his aunts Caroline and Charlotte. But at which school was Henry Oliver Atcherley educated? Despite the Atcherley connections with Shrewsbury School, he was certainly not a pupil there as his name does not appear in its registers. Fortunately, a report on “Cambridge University Local Examinations” in the Exeter and Plymouth Gazette of 10 Feb 1865 gives some vital clues. The article noted that 61 candidates had been examined at the Exeter centre for the 1864 examination and among the Junior candidates listed were “H. O. Atcherley, Nismes”, under schoolmasters C. R. Roper and J. Ingle. The Reverends Charles Rodwell Roper and John Ingle, it turns out, were masters of Mount Radford School, situated a little to the south-east of Exeter (pictured below). The school (or college as it is also referred to) was established in 1826 and Charles Roper was enumerated there in the censuses of 1841, ’51 and ’61. Newspaper advertisements show that Roper entered into a formal partnership with John Ingle in the mid-1860s (with Roper as Principal and Ingle as Head Master), and that their school offered “special advantages to boys between the age of Seven and Fourteen; and also to boys of delicate health.” The school’s half-year sessions began, after the Christmas and Summer vacations, at the end of January and the end of July each year. It is unlikely that Mount Radford was chosen as the place of Henry Atcherley’s education because of “delicate health” given that he was a competitor, in 1865, in the Exeter Swimming Matches. These matches, arranged by Exeter’s Bathing Committee, took place at the city’s Head Weir bathing ground off the River Exe. It was reported that: “Owing to the late heavy rain there was a strong current; but the competitors were remarkably ‘plucky.’” Henry was not among the winners of the Youths of Exeter (under 16) competition and so missed out on the prizes: £1 10s for first place, a telescope (second), a silver Albert chain (third) and a concertina (fourth place). 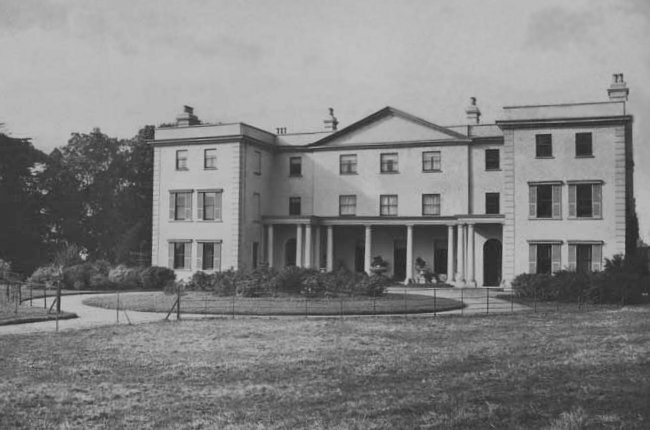 The fact that Mount Radford was local to Caroline or Charlotte Atcherley appears a more likely explanation for its choice – yet many of the school’s pupils were not local. The 1861 census shows that the birth places of some of Mount Radford’s 28 boys (aged from 9 to 18) ranged from Nottingham, London, Hampshire and Scotland to Barbados, Canada and India. And as I noted above, the newspaper report which listed Henry Atcherley as a pupil of Roper and Ingle in 1865, referred to him as “H. O. Atcherley, Nismes”. Nîmes is a town in the south of France, not a place I would have expected a Devonian boy like Henry Atcherley to give as his place of residence. Possibly it was where his mother lived, and where he went to stay during his school vacations. Alternatively, it may have been the abode, for a while at least, of his aunt Charlotte, who I have yet to find on either the 1861 or 1871 census of England and Wales. As a lady of independent means, with a passport issued to her in 1856, she may well have spent a good deal of time abroad, and Henry might have stayed with her for some of that time. In the end, my quest for information about Henry Oliver Atcherley’s education has generated at least as many questions as it has answers. If there’s one lesson I have learned, it is that this is often the way of things where family history is concerned! Picture credits. Receipts: photos by the author. Mount Radford House: Image taken from Culture Grid and used under a Creative Commons licence. Birth of Henry Oliver Atcherley registered at Newton Abbot, June quarter 1850; volume 10, page 162. 1851 census of England and Wales. Piece 1940, folio 420, page 19. 104 New Sydney Place, Bath, Somerset, England. 1851 census of England and Wales. Piece 1871, folio 627, page 21. Mile End Cottage, Highweek, Devon, England. 1861 census of England and Wales. Piece 1388, folio 14, page 21. 2 Lower Mount Road Terrace, Exeter, Devon, England. TNA item ref PROB 11/2262/42: Will of Henry Oliver of Doctors Commons London. Proved 3 Dec 1857. Copy viewed at Ancestry. Also available from The National Archives website. London Gazette, issue 23724, 7 Apr 1871, page 1822: “HENRY OLIVER, Deceased … Henry Oliver, late of Doctors’ Commons, London, and of the city of Bath, Esq., deceased (who died on the 22nd day of October, 1857, and whose will was proved by G. D. Hill and Charlotte Atcherley, the executors therein named …”. Copy viewed at London Gazette website. John Ernest Auden (ed.) (1909), Shrewsbury School Register. 1734-1908. Copy viewed at Internet Archive. John Britton and Edward Wedlake Brayley (1832), Devonshire & Cornwall Illustrated, page 67: “Mount Radford College. …” Copy viewed at Google Books. Anon (2007): Charles Rodwell Roper (web page, accessed 1 Mar 2014). Exeter Memories: Blackaller and Head Weirs (web page, accessed 1 Mar 2014). 1861 census of England and Wales. Piece 1388, folio 4, page 1. Mount Radford House, Exeter St Leonard, Devon. Wikipedia: Nîmes (web page, accessed 1 Mar 2014). The National Archives’ indexes of Names of Passport Applicants from the Chief Clerk’s Department and Passport Office of the Foreign Office (FO 611) shows that passport number 41177 was issued to Miss Charlotte Atcherley on 3 September 1856. Copy viewed at Find My Past – Register of Passport Applications.